More and more young autistics (with Asperger’s syndrome or high-functioning) study in higher education. But only a few is identified and accompanied. These students often present a big intellectual capacity and sometimes succeed in their studies splendidly. However, their occupational integration is problematic. Their difficulties are so important that without an adapted preparation they cannot integrate the occupational environment. The objective is to insure that the young autistic students (with Asperger’s syndrome or high-functioning) have a satisfactory social and professional integration. The employment improvement for autistic youth will allow reducing the part of them who will stay in the unemployment at the end of their studies. Meets all autistic students (and their relatives), estimates the challenges and proposes arrangements adapted to each. Helps autistic students to understand what is expected from them in a professional environment and advise professionals on how they can work with these young people. Advises teachers and all participants in higher education institutions. Meets Companies in which students carried out their internships or are employed and he proposes improvements. He experiments these arrangements in connection with the HR managers or Head of the Disability Department. Prepares the students for job interviews or for competitions examinations. Assists students in their search for internship and employment. To inform companies and thus facilitate the hiring, HANDISUP has published a practical guide, the SIMON Guide. 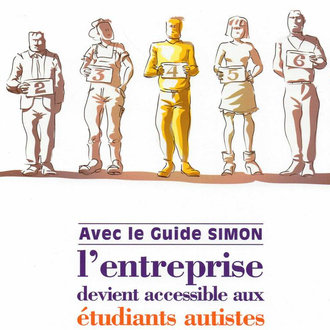 With the SIMON Guide, the company becomes accessible to people with autism! In Belgium In Switzerland Partnership with "Terre Plurielle"
During their studies, autistic students face difficulties related to the requirements of post-baccalaureate studies and to their particular functioning. Method of work or communication problems may appear. The autism project representative meets all the students and teachers to assess these difficulties. He informs teachers about autism from high-level and advises them on their way to communicate with them. The autistic students can bloom in different professional areas provided that the working environment is well adapted. Indeed, the main obstacle to employment lies in the mode of communication of these young autistics, not very accessible to the untrained persons, and their difficulty in decoding social interactions. The project representative helps young autistic people to better understand what is expected from them in the workplace and advises professionals on how they can work with these young people. The job interview and the relations with the colleagues, for example, suppose a knowledge of some social rules, an understanding of unspoken and the frequent presence of the implicit which is difficult to decode for the autistic. Also, all the new situations are an additional difficulty because they generate much stress. The autistic needs an explicit and detailed knowledge of how the business works; the team practices and the expectations of each. The difficulties for an autistic adult to find and keep a job are not the consequence of a lack of vocational aptitudes but of difficulties concerning their social skills and of communication. Is as important as university success. That’s the reason why HANDISUP proposes activities to his members weekly: theater workshop, games club in which the autistic students participate. Some relational difficulties can appear on the theater workshop because the autistics understand not always neither what we expect from them nor how they have to behave. The project leader watches the student’s participation in these activities by adapting the modalities. Being a student also means becoming autonomous: use the transportation means, make an appointment, do some shopping, etc. Working on their autonomy with the autistic students is thus essential. It can involve for example: helping them to set an appointment by telephone, to detail with them the way to go to an interview or even to help them to get organized in their daily life.